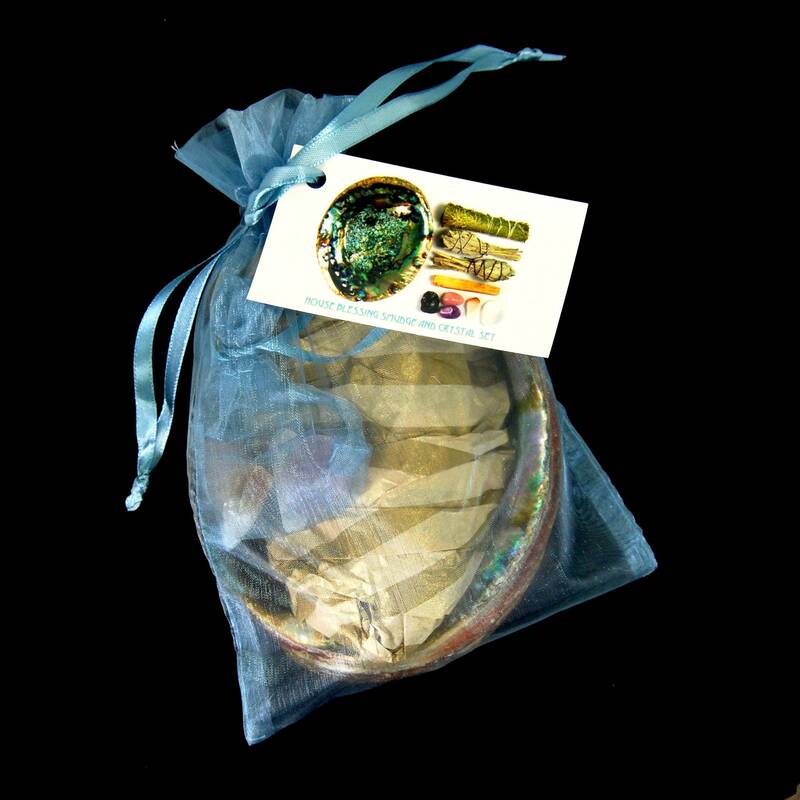 1 large Abalone shell to use as a burner for your smudges. 2 California White Sage torch smudges. 1 piece of rough Black Tourmaline. 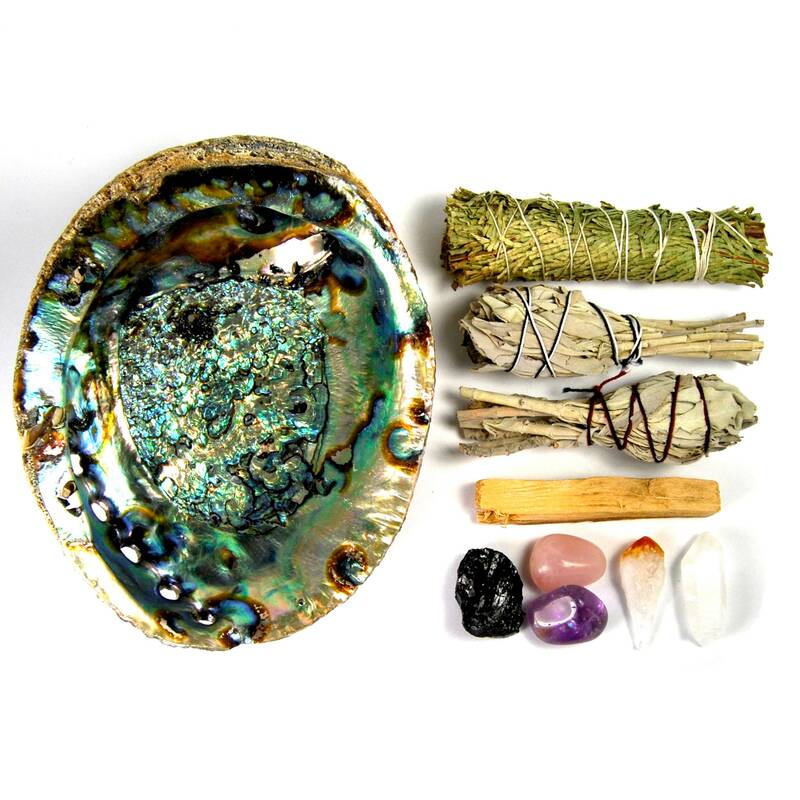 This kit comes packed in a blue organza bag with a card that has the metaphysical properties of the crystals printed on the back. ❤︎White Sage❤︎ is a very popular smudge used by Native Americans to cleanse, purify, and bless a space or person. It is thought to attract good spirits and cleanse negative energies. Very popular to use during meditation and prayer as an offering. ❤︎Cedar❤︎ much like White Sage, is a very popular smudge used by Native Americans to cleanse, purify, and bless a space or person. It is thought to attract good spirits and cleanse negative energies. It is said to improve wisdom, strength, certainty, and endurance. Very popular to use during meditation and prayer as an offering. ❤︎Palo Santo❤︎ literally means "Sacred Wood" and is burned for its cleansing properties. It comes from Peru and is said to connect you with respect for Nature and Mother Earth because of the process in which it is collected. The branches need to die naturally and season for some time before the essential oils are released and matured to their full capacity. Because of this, the collection of Palo Santo is regulated to to the natural windfalls from the living tree. The scent of this Holy Wood is spicy and attractive and unlike anything else on Earth. ❤︎Black Tourmaline❤︎ is the ultimate stone of protection; spiritual, emotional, and physical. Shields against negativity. Purifies inner thoughts or conflicts transmuting them into positive energy. Psychic protection. Protects against EMFs. ❤︎Clear Quartz❤︎ is thought to be a Master Healer. It is a perfect stone for amplifying your intention, as well as the effect of other stones. It produces harmony of the body and mind, allowing one to think more clearly an act effectively. Increases physical and mental energy, perseverance, and patience. Re-directs negative energy to a positive state. Enables one to laugh and love more easily. ❤︎Citrine❤︎ enhances intelligence. Promotes a happy disposition. Encourages one to look forward towards the sunrise. Brings comfort and optimism, all of which lend to a more inspired and creative disposition. It is also a stone of Wealth and improves financial situations. Brings about good fortune and prosperity in business. Attracts good luck. ❤︎Amethyst❤︎ is thought to be the stone of peace. It calms fears, raises hopes, lifts spirits, strengthens commitments. Helps overcome addictions. Increases psychic awareness. Aids good judgement. Excellent energy healer, especially with emotional issues. Chakra balancing. ❤︎Rose Quartz❤︎ is thought to be the stone of Universal love. It stimulates and attracts love. Promotes peace and happiness. Emits a calming energy. Reinstates self love, gentle love. Brings fidelity and peacefulness to existing relationships. Promotes receptivity to art, music, and literature.